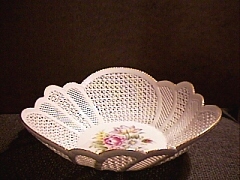 This is a handmade porcelain lace bowl hand crafted in Romania by Moga Porcelain Manufacturers. Each piece that is made is unique and is signed by the artist. This bowl is 8" in diameter at the top and 4 1/4" in diameter at the bottom of the bowl. It is 2 1/4" deep. The scalloped rim is edged with gold paint, and there are seven arched panels just below the rim, each with a beautifully painted rose. The flowers in the bottom of the bowl are also beautifully handpainted. These are very beautiful and delicate items, made with the same fine porcelain as all Moga items. This is a handmade and hand painted porcelain lace bowl hand crafted in Romania by Moga Porcelain Manufacturers . Each piece that is made is unique and signed by the artist. This particular bowl is approximately 2 " deep and 4 1/4" in diameter at the base, flaring out in a graceful curve to a scalloped edge, trimmed with gold that is 8" in diameter. The flowers in the bottom are beautifully hand painted. These are very beautiful and delicate items. This is a handmade and hand painted heart shaped porcelain lace bowl hand crafted in Romania by Moga Porcelain Manufacturers . Each piece that is made is unique and signed by the artist. 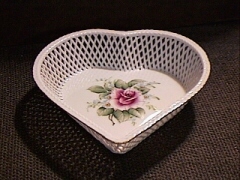 This particular bowl is approximately 1 1/4" deep and 3 1/2" at the widest point in the base, and 5" in width at the widest point at the top of the heart. The flowers in the bottom are beautifully hand painted. These are very beautiful and delicate items. 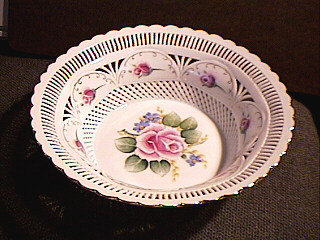 This is a handmade and hand painted porcelain lace bowl hand crafted in Romania by Moga Porcelain Manufacturers . Each piece that is made is unique and signed by the artist. This particular bowl is approximately 2 1/2" deep and 4 1/4" in diameter at the base, flaring out in a graceful curve to a scalloped edge, trimmed with gold that is 8" in diameter. The flowers in the bottom are beautifully hand painted. These are very beautiful and delicate items. 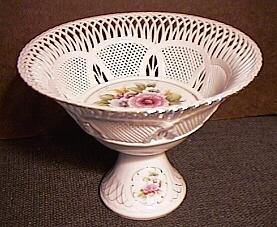 This is a handmade and hand painted porcelain lace fruit bowl hand crafted in Romania by Moga Porcelain Manufacturers. Each piece that is made is unique and signed by the artist. This particular bowl is approximately 5" high overall. The bowl portion is approximately 2" deep and the base about 3" tall. The bowl measures approximately 6 1/2" across the top, 3 1/4" at the bottom of the bowl, and 2 3/4 at the bottom of the base. The flowers in the bottom are beautifully hand painted. There is also a painted flower on each side of the base along with gold design lines. These are very beautiful and delicate items. 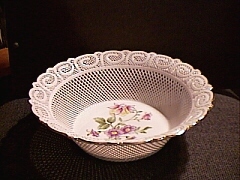 This is a handmade and hand painted porcelain lace covered bowl hand crafted in Romania by Moga Porcelain Manufacturers . Each piece that is made is unique and signed by the artist. This particular bowl is approximately 1 1/2" deep and 3" in diameter at the base, flaring out in a graceful curve to a scalloped edge, trimmed with gold that is 5" in diameter. 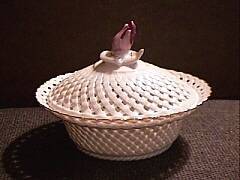 The top rests on a braided design just below the rim and is 4" in diameter and 2" high to the tip of the rose bud top. These are very beautiful and delicate items.